Male warrior demonstrating the use of a wickerwork shield (kube), possibly with a spear attached to it behind. He appears to be holding another weapon in his right hand, possibly a throwing knife. 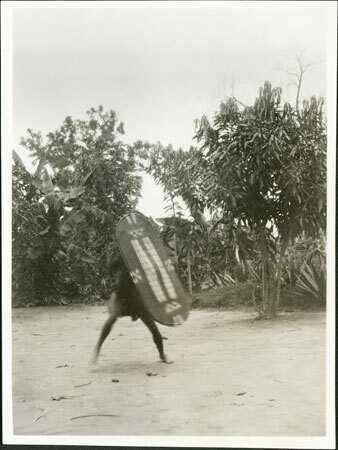 Although the use of shields was illegal under British adminstration, Evans-Pritchard had several examples made for him by those who still knew the craft. Notes on card mount m/s pencil - "severe rcs 11/11/86 EE"
Morton, Chris. "Zande warrior with shield" Southern Sudan Project (in development). 03 Jan. 2006. Pitt Rivers Museum. <http://southernsudan.prm.ox.ac.uk/details/1998.341.1.2/>.